Beginning in 1921, definitive Belgium stamps were replaced by two completely new designs, and in 1924, the first regular commemorative postage stamps were issued. 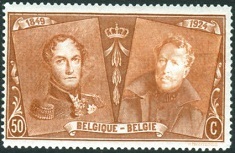 The new series of Belgium stamps shown above was issued between 1922 and 1927. Each of the stamps features a three-quarter-right portrait of King Albert I. These lower denomination definitive postage stamps are typographed and perforated 14. 1 C. (1922 - Scott #144) - Orange. 2 C. (1926 - Scott #145) - Olive. 3 C. (1922 - Scott #146) - Fawn. 5 C. (1922 - Scott #147) - Gray. 10 C. (1922 - Scott #148) - Blue Green. 15 C. (1923 - Scott #149) - Plum. 20 C. (1922 - Scott #150) - Black Brown. 30 C. (1922 - Scott #152) - Vermilion. 30 C. (1925 - Scott #153) - Rose. 35 C. (1922 - Scott #154) - Red Brown. 35 C. (1927 - Scott #155) - Blue Green. 40 C. (1922 - Scott #156) - Rose. 50 C. (1925 - Scott #157) - Bister. 60 C. (1927 - Scott #158) - Olive Brown. 1.25 F. (1926 - Scott #159) - Deep Blue. 1.50 F. (1926 - Scott #160) - Bright Blue, Bright Sky Blue, Intense Bright Blue. 1.75 F. (1927 - Scott #161) - Ultramarine. The 1.75 F. denomination also exist in tête-bêche pairs from booklet sheets. One is shown above. In 1927, Belgium began issuing the 1.75 F. denomination stamps in vending booklets, containing panes of four stamps and two commercial advertising labels. This practice of using commercial advertising labels in stamp booklets continued into the 1930's. These labels are often collected in horizontal pairs, with the adjacent postage stamp. There are many different varieties of these labels and some of them are VERY expensive! The new series of higher denomination Belgium stamps shown above was issued between 1921 and 1925. Each of the stamps features a left-facing portrait of King Albert I. These higher denomination definitive postage stamps are engraved, with many different perforation gauge combinations, ranging from perforated 11 to perforated 12 1/2. 50 C. (1921 - Scott #162) - Dull Blue. The size of the design of this 50 C. denomination is 18 x 20 3/4 mm. The stamps were issued in sheets of 100. 75 C. (1922 - Scott #163) - Scarlet. 75 C. (1924 - Scott #164) - Ultramarine. 1 F. (1922 - Scott #165) - Black Brown. 1 F. (1925 - Scott #166) - Dark Blue. 2 F. (1922 - Scott #167) - Dark Green. 5 F. (1923 - Scott #168) - Brown Violet. 10 F. (1922 - Scott #169) - Magenta. With the engraved printing, these new definitive postage stamps were very impressive looking, but their overall production was a failure. They were all replaced by new high denomination stamps of the 1922 typographed definitive series in 1926. The stamp at the upper left was issued May 26, 1921 for the Brussels International Philatelic Exhibition of 1921. The stamp is engraved and perforated 11 1/2, and it was printed in souvenir panes of 25 which were only available for purchase at the exhibition. 50 C. (1921 - Scott #170) - Dark Blue. The size of the design of this 50 C. denomination is 17 1/2 x 21 1/4 mm. The stamps were issued in souvenir panes of 25. The stamp at the upper right was issued May 24, 1924 for the Brussels International Philatelic Exhibition of 1924. The stamp is engraved and perforated 11 1/2, and it was printed in souvenir panes of four, measuring 130 x 145 mm, which were only available for purchase at the exhibition. 5 F. (1924 - Scott #170a) - Red Brown. 5 F. (1924 - Sheet of Four - Scott #170) - Red Brown. These six higher denomination definitive Belgium stamps of the types of the defintitive stamp series of 1922 were issued between 1926 and 1927. These new stamps are typographed and perforated 14, and they replaced the higher denomination engraved definitive postage stamps issued between 1921 and 1925. 75 C. (1926 - Scott #185) - Dark Violet. 1 F. (1926 - Scott #186) - Pale Yellow. 1 F. (1927 - Scott #187) - Rose Red. 2 F. (1926 - Scott #188) - Prussian Blue. 5 F. (1927 - Scott #189) - Emerald. 10 F. (1927 - Scott #190) - Dark Brown. The 1 F. Rose Red denomination also exist in tête-bêche pairs and in booklet panes of 4 + 2 advertising labels. The four definitive stamps shown above were overprinted and revalued during 1927. 3 C. on 2 C. (1927 - Scott #191) - Olive. 10 C. on 15 C. (1927 - Scott #192) - Plum. 35 C. on 40 C. (1927 - Scott #193) - Rose. 1.75 F. on 1.50 F. (1927 - Scott #194) - Blue. The three definitive stamps shown above were revalued on January 1, 1929. 5 C. on 30 C. (1929 - Scott #195) - Rose. 5 C. on 75 C. (1929 - Scott #196) - Dark Violet. 5 C. on 1.25 F. (1929 - Scott #197) - Blue. These Belgium stamps are actually pre-canceled, with the revalued amount built into the pre-cancellation device. The thirteen stamps shown above were all issued in 1925 (Scott #172-184) to commemorate the 75th Anniversary of Belgian Postage Stamps. The designs feature portraits of King Leopold I and King Albert I. The King Leopold I portrait is the same one used for the Epaulette Issue of 1849.